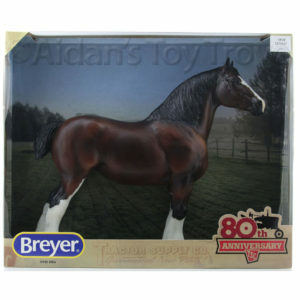 I love my Breyer Prism and I’m hoping for the Glossy Rainbow color on Finn as well! Meet Finn! He is offered as a gambler’s choice, as four exciting colorways grace this delightful mule. You will randomly receive one of the following: A shaded grey grulla pinto with a matte finish, a shaded dun appaloosa with matte finish, a shaded chestnut with a high gloss finish, or a shaded rainbow pinto decorator with a high gloss finish. Finn comes in a miniature Traditional-style window box. 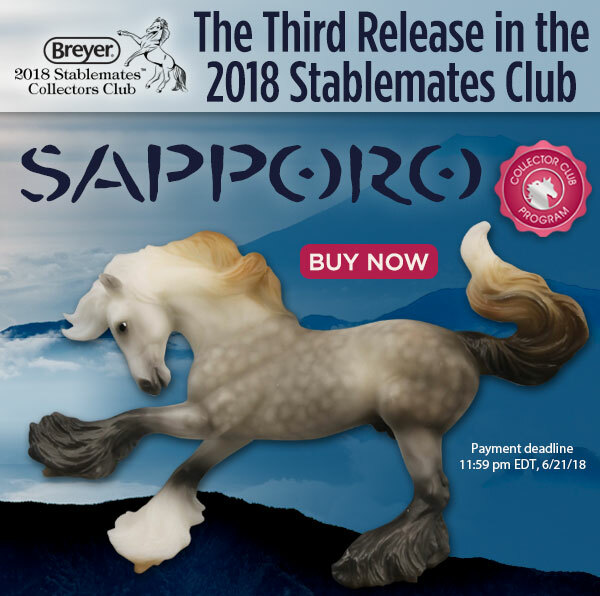 Whip out your wallet Breyer Stablemate Club members, Sapporo is ready to order! 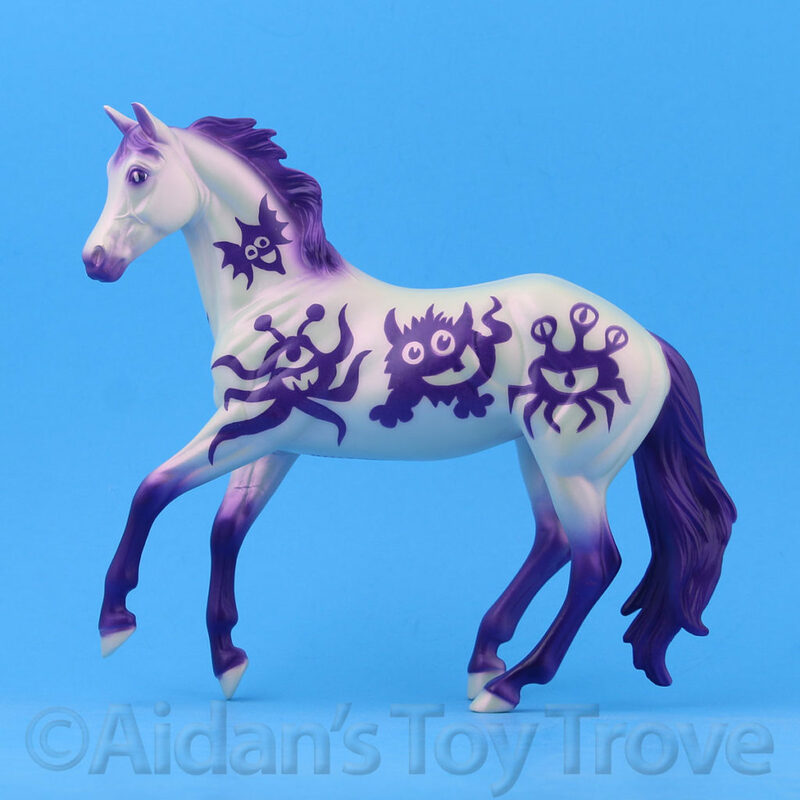 He is a new Stablemate mold and is a miniature version of the Brishen mold. 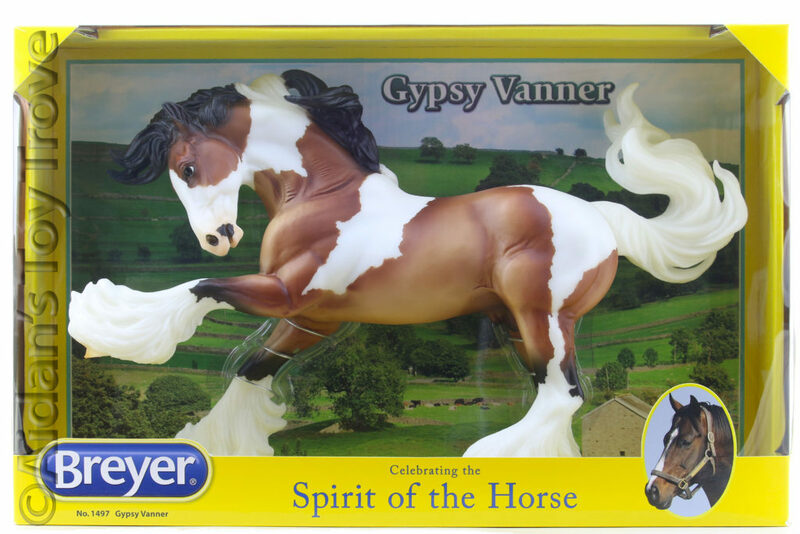 The current release on the Brishen mold is the Gypsy Vanner. Just look at how well this fellow translated to miniature! 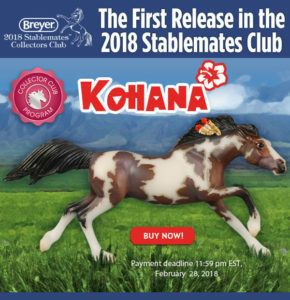 Kohana, the first release in the Breyer 2018 Stablemate Club was released earlier this month. I just now got around to purchasing my personal (and only) copy. 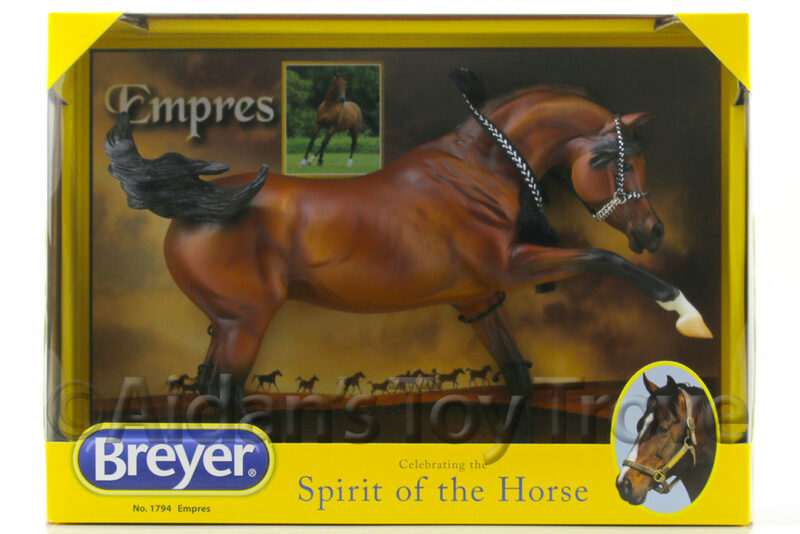 He is the Breyer Stablemate G3 Mustang mold with sculpted on feathers in his mane. He is a beautiful bay roan pinto with yellow and red ribbons. The American Indian name “Kohana” means swift, and this mustang certainly looks like he’s living up to his name! Designed by Franceyn Dare, Kohana has a flashy bay roan pinto coat that’s enhanced by mapped markings. 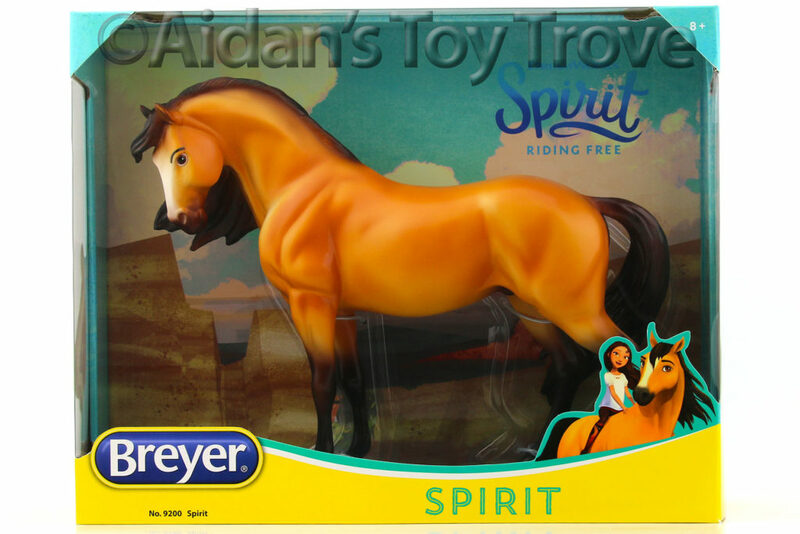 Exclusively designed for 2018 Club members, he also has a new feature never before seen on this mold: beautifully-detailed molded feathers adorning his mane! Kohana comes in a miniature Traditional-style window box. Yup, it’s that time of year again! 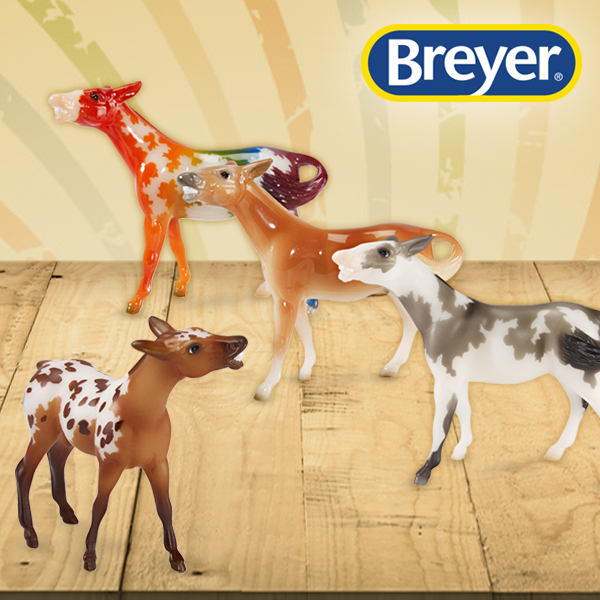 Time to pay all the new Breyer membership dues! 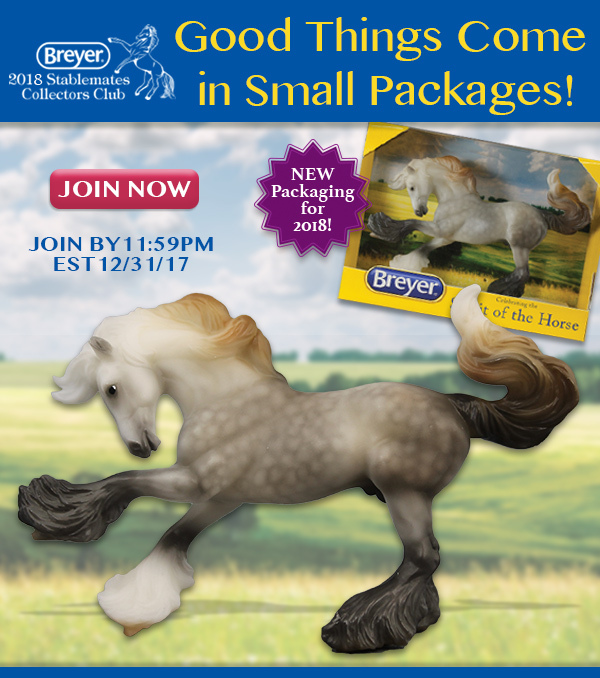 Today is the first day to join the Breyer 2018 Stablemate Club! Next year’s models will be packaged in tiny boxes. 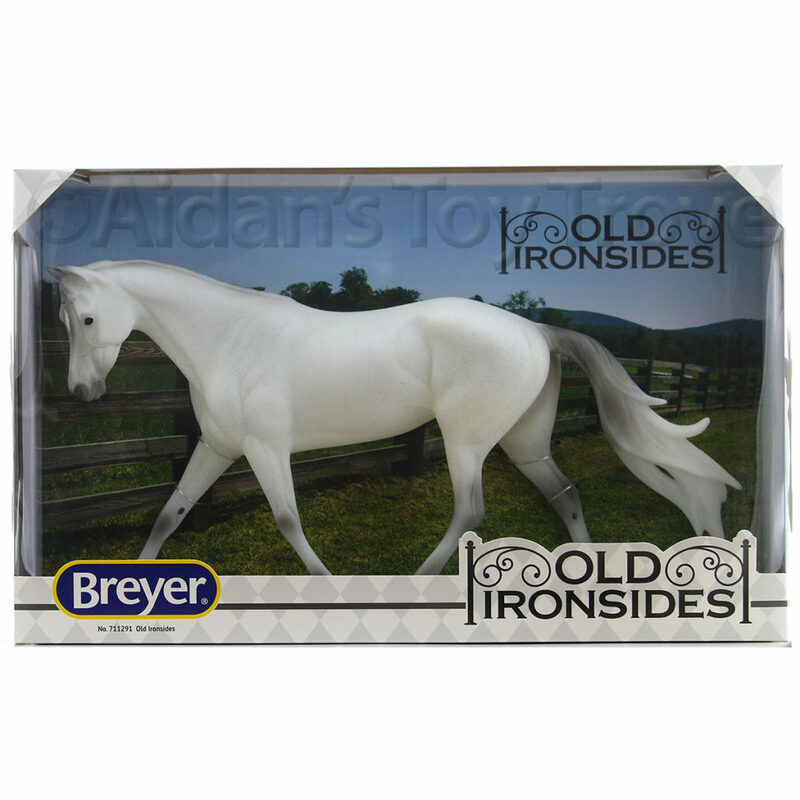 Hobbyists have been producing tiny boxes like this for years and Breyer has finally decided to follow in their footsteps and offer official Breyer boxes for the Stablemate Club models! I adore the boxes but I’m a bit nervous about potential box rubs. 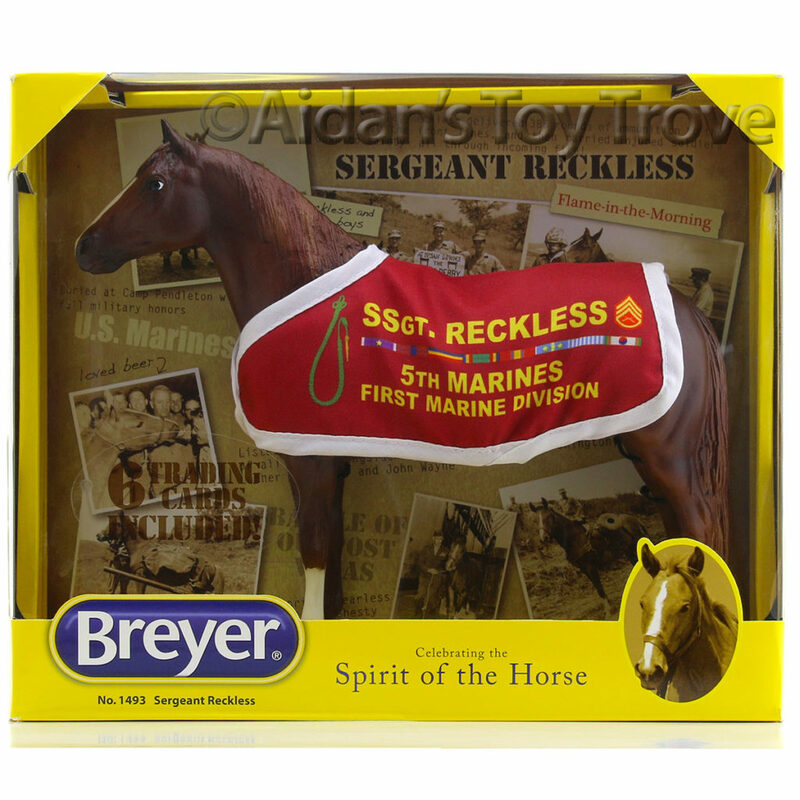 I very much liked the little satin bags that the past year’s Breyer Stablemate Club models have come packaged in. The bags worked wonderfully for storage and there was no chance of paint rubs caused by the packaging. The first Stablemate Club model of 2018 will be Kohana. 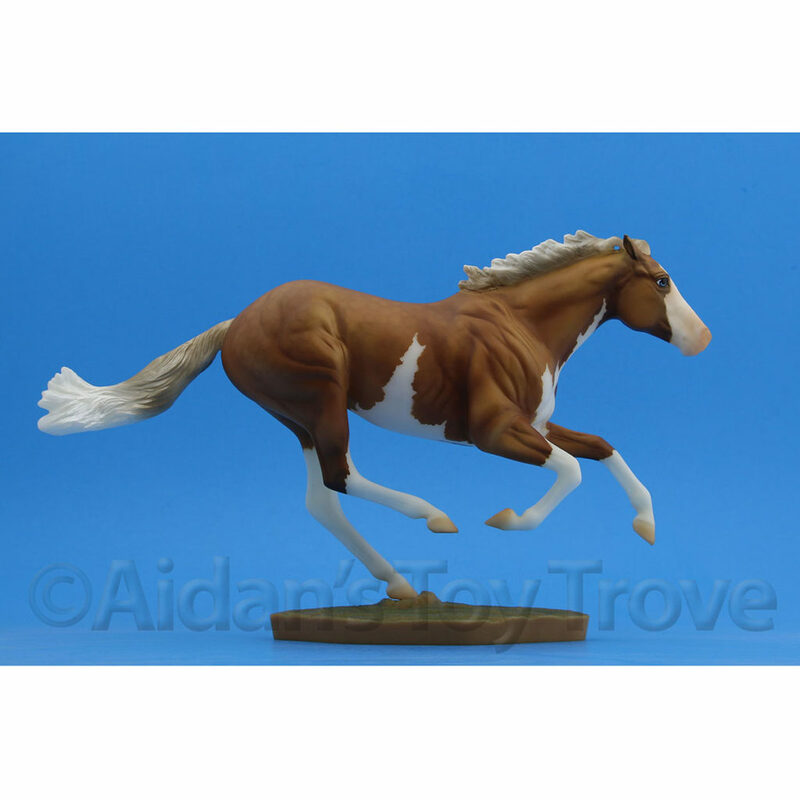 He is the G3 Mustang mold which was sculpted by Jane Lunger. 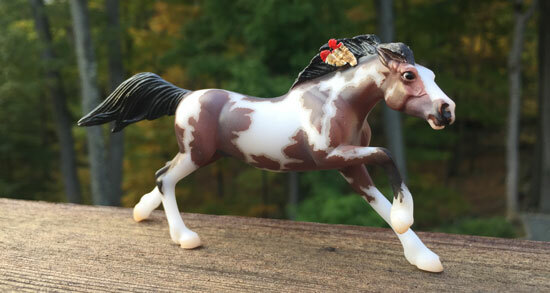 He is painted as a flashy bay roan pinto with mapped markings and Indian feathers in his mane. 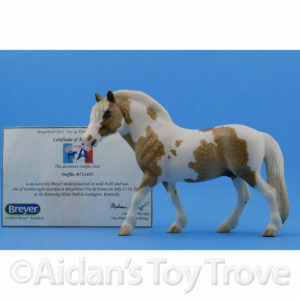 His color was designed by Australian artist Franceyn Dare whom I own several Breyer Customs Stablemates by. 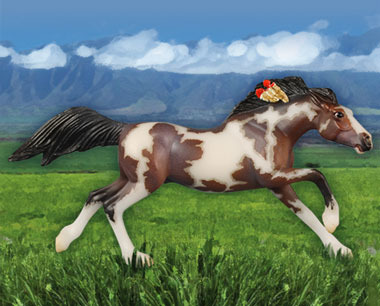 To my knowledge, Kohana is the first Breyer model that Franceyn has designed. How exciting! I am in love with the new Mini Brishen mold. 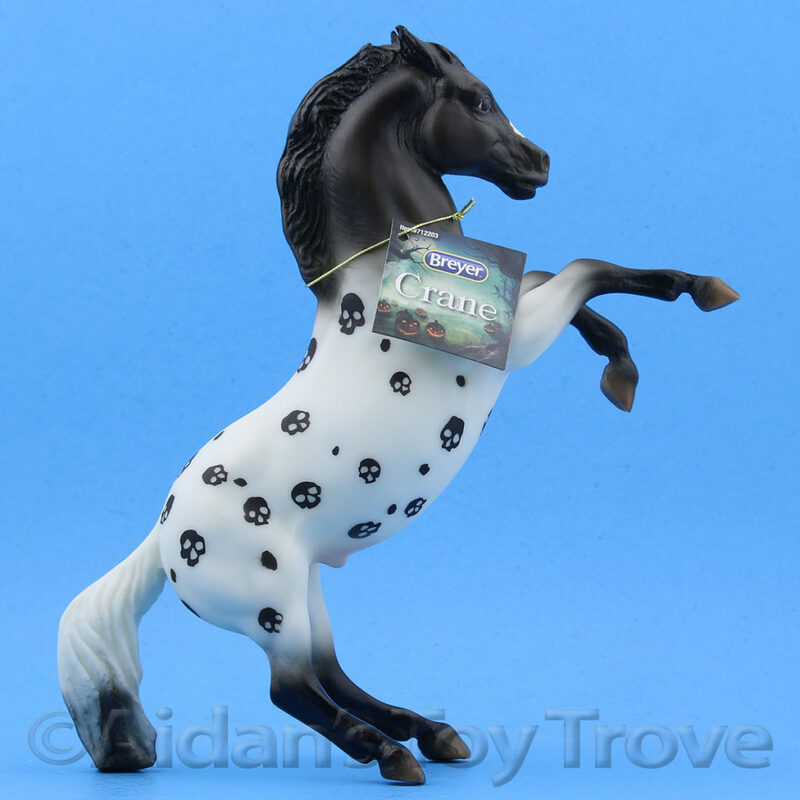 He truly looks to be a miniaturized version of the Traditional Scale Gypsy Vanner which was sculpted by Kathleen Moody. 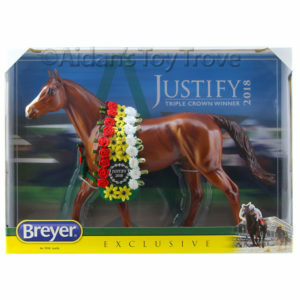 The cost to join the Breyer 2018 Stablemate Club is $30 and must be joined by December 31st, 2017. There will be six Stablemates released with one of them being the Gambler’s Choice Model. 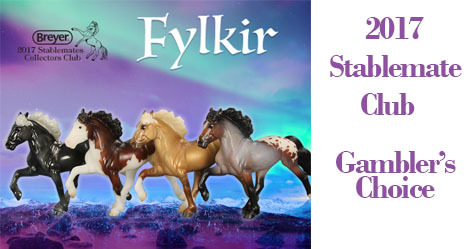 The Breyer 2017 Stablemate Club was Fylkir. I received the bay pinto. 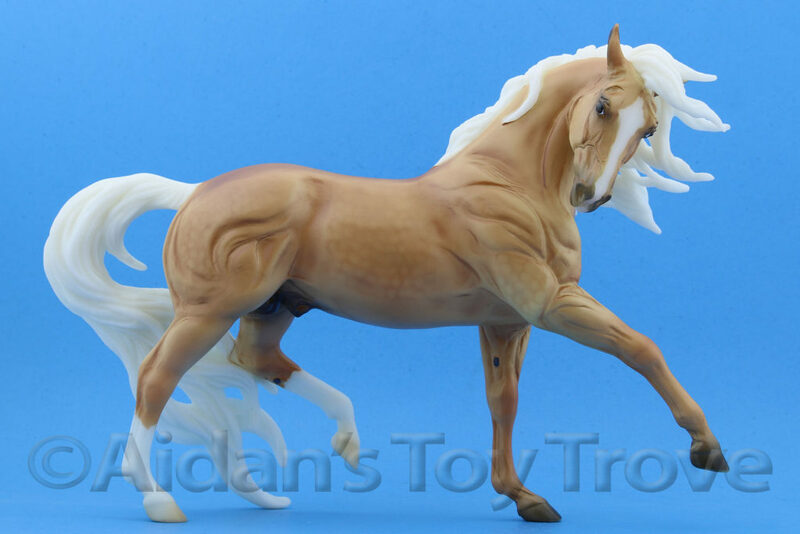 The new sculpt for the Breyer 2018 Stablemate Club will be an Arabian by Tabitha Pack. 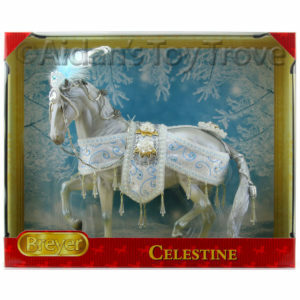 The $30 deposit will be applied towards each model which brings the price for each horse to $15 + shipping and handling. You must purchase every model or you will lose your spot in the Stablemate Club. 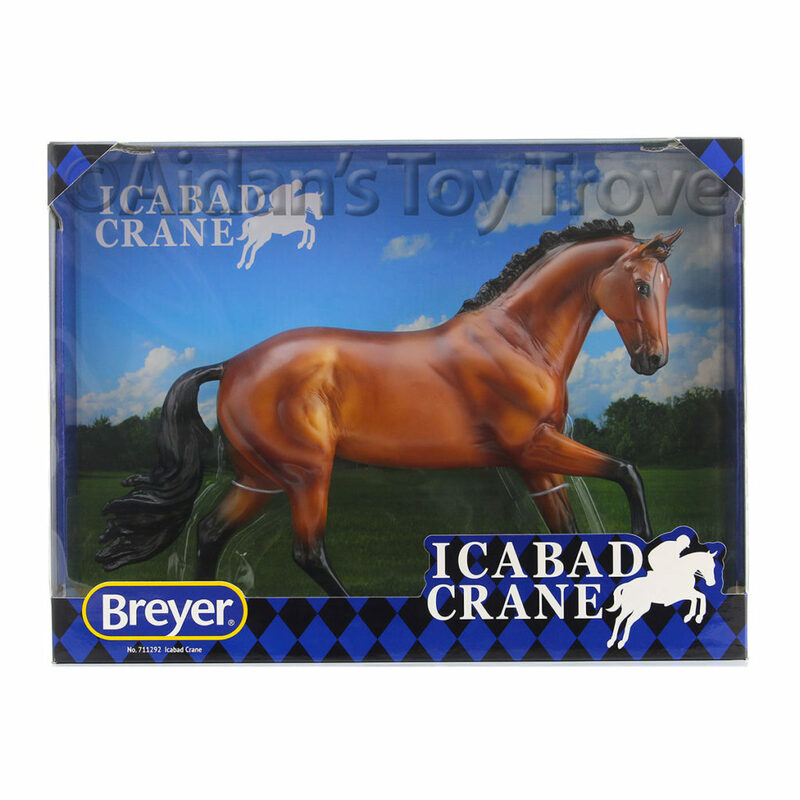 Here is a picture of all of the Breyer 2017 Stablemate Club horses. The 2018 Stablemates Collector’s Club begins with Kohana, a stunning bay roan Mustang! 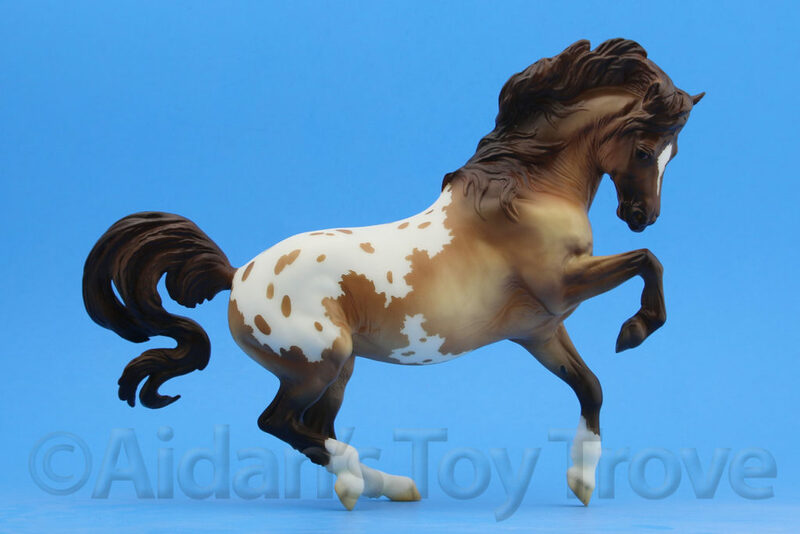 Designed by talented Australian customizer Franceyn Dare, Kohana has MAPPED overo pinto markings and Indian feathers in his mane! 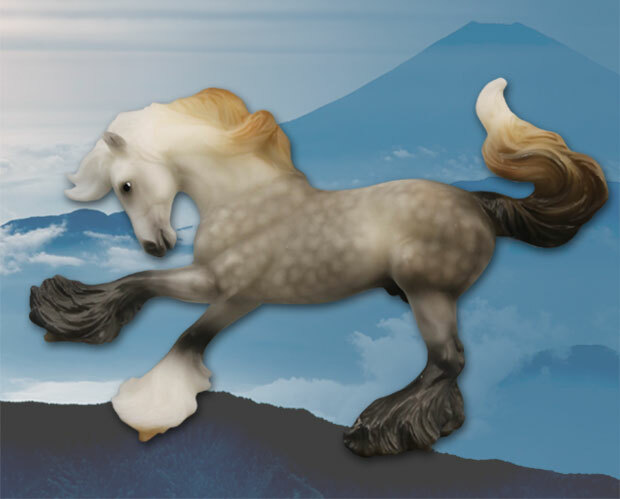 The Club will have six releases, one every other month, and will include a Gambler’s Choice (you’ll receive one of four colors, randomly selected), a mini me Gypsy Vanner, and a brand new Arabian sculpture by Tabitha Pack! Join by 11:59pm EST, 12/31/17! 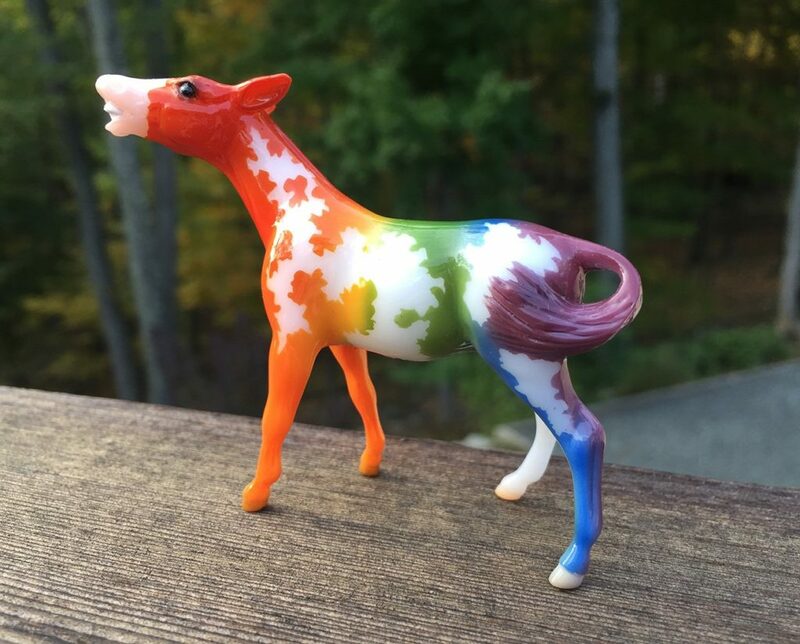 Each model is only $20, and is shipped to your home in a mini window gift box. To join, you must have a valid Collector Club membership purchased on or after April 1, 2017, or a 2018 Collector Club membership and sign up by December 31, 2017 with a non-refundable deposit of $30. We’ll deduct $5 from each model when it ships, so you pay $15 per model (plus S&H). This program is a continuity club which means you are obligated to purchase all six models. First Shipment for US members is in February 2018, with subsequent shipments every other month. You must purchase an international club membership if you are shipping outside the US.